One thing I make once a week are chicken cutlets. A crowd pleaser for both kids and adults alike. These were a staple in my house growing up. Skinless, boneless chicken breast dipped in egg, breaded in doctored Progresso bread crumbs (garlic powder would be added) and fried in an ancient pan purchased all the way back in the ’70’s. Once I got my own place I started making cutlets as well, filling my apartment with the smell of my mother’s and grandmother’s kitchen. As I got older I tweaked and updated the recipe. By the time I owned my own kitchen I had gotten my own cutlet recipe just right for my tastes, and it was a decent departure from what I’d been taught. Honestly – and this is going to sound cocky and I apologize, but it’s true – the only complaint I get about these chicken tenders is that they have ruined numerous friends and family on being able to order fried chicken and chicken strips when eating at bars and restaurants. Once you get this recipe down pat, this chicken is way better than anything you can order out. First things first: I chucked the Progresso to the wind. 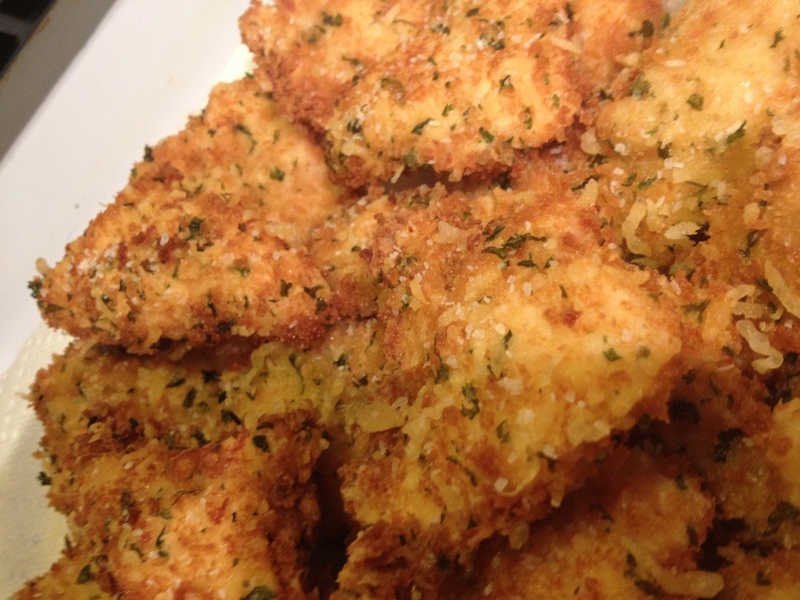 Swapped them for panko. Next, I stopped serving them as a partner with pasta or marinara and cheese. 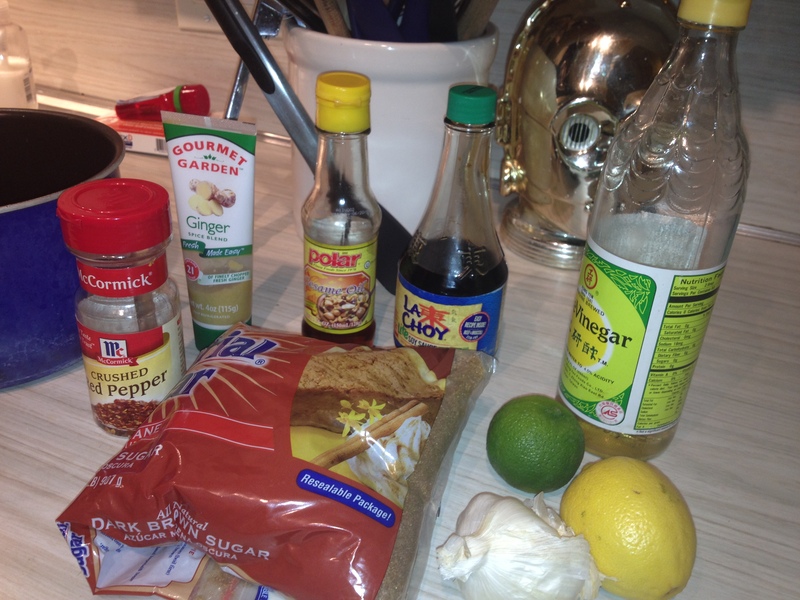 And finally, inspired by Americanized Asian fare, I created my own sauce, which is what we’ll start with. Throw everything into a medium sauce pan and boil down until it’s about 1/3 of it’s original volume, nice and syrupy. Be careful with this; you’re cooking down a liquid containing red pepper, so the thicker it gets, the spicier it is. You can pour this over chicken, toss veggies in it, or be a super adult and use the sauce for dunkin’. I don’t use a deep fryer, just a cast iron pan filled with about 1 1/2 inch of oil. Beat the two eggs in a small bowl or tupperware container. In a flat, edged container (I use an 8in. X 8in. pyrex, but even a plate will do) mix the flour, panko, parm, and parsley. Rinse, dry, and cut the chicken how ever you’d like. This evening I cut my chicken into half tenders, large nuggets really, but anything is fine. 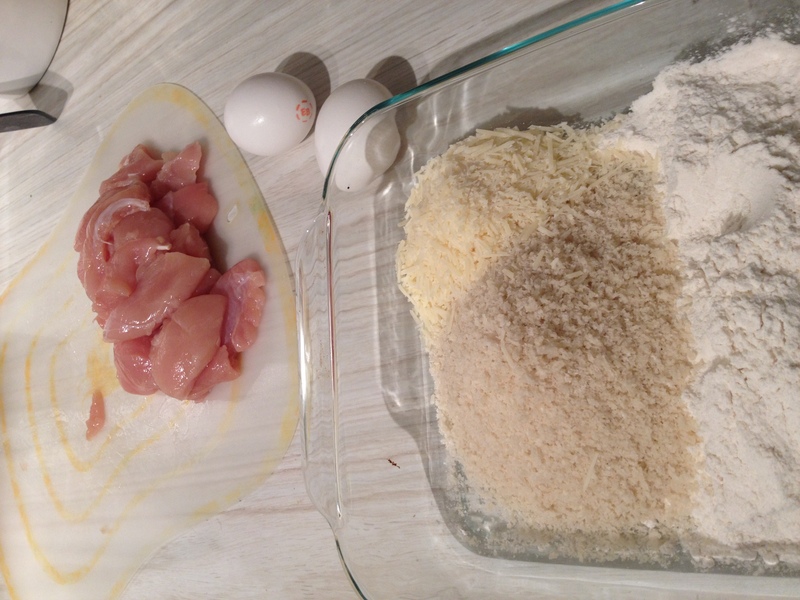 Dip the chicken in the beaten egg, let the excess drip off, coat both sides of the chicken in the panko/flour mixture and set aside. Here, I’ll show you. My tenders were roughly 1/2 inch thick and 3 inches by 2 inches. They took about 3-4 minutes per side. In the right temperature they won’t brown too quickly, but will turn to a beautiful light golden brown gradually. Once the chicken is out of the fry pan, place them on a plate layered with a paper towel to help drain the excess oil. Sprinkle immediately with kosher salt. This MUST be done while they’re still warm. Let them sit at least five minutes before you start gorging your face; I promise – those few minutes will feel like an eternity, but they’ll be worth it. 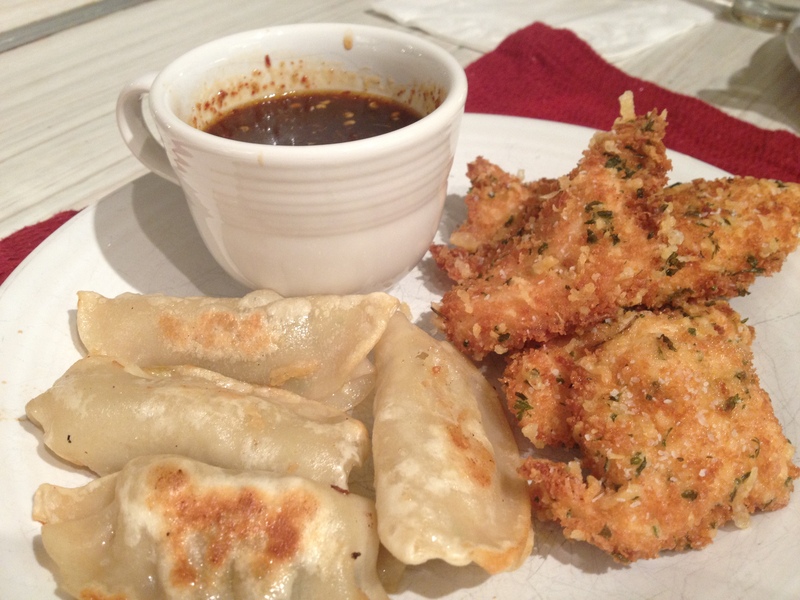 This time around I decided to serve the chicken with oven fried dumplings. I steamed a bunch of the grocery store bought frozen chicken dumplings, while heating my oven to 500. Super hot. I tossed the dumplings with 1/2 a tablespoon of sesame oil, sprayed a cookie sheet with cooking spray, and placed the dumplings in the oven for about 8 minutes, turning once. The perfect veggie for this dish, not seen on the plate, is crisp, bright, green beans, sauteed with garlic and sea salt. Delicious and a wonderful pop of color. All in all, it’s great for a pseudo Chinese food dinner at home and beats the hell out of paying P.F. Chang’s for what would wind up being a less satisfying meal. This entry was posted in Uncategorized and tagged american, asian, chef, chicken, chinese, cooking, cutlet, diet, dinner, dumpling, eat, food, foodie, fried, fusion, orange sauce, recipe, recipes, sauce, take out.